So, you found what you think is a perfect property for your next flip. Are you sure you will make money with this project? Over the years, PSG Lending has seen many investment projects that should have never gotten off the ground. Whether it is an issue with a weak submarket, wrong assessment of the sales comparisons, a poor budget, or lack of liquidity – there are many reasons why a deal can leave you wondering, “Where did my money go?” Having a checklist is a useful tool for helping you make good investing decisions and avoid making expensive mistakes when doing a flip. Not choosing the right market will kill your deal before you even start. Knowing the market will help you understand what upgrades to include in your rehab, and more importantly will increase the likelihood that there is a buyer waiting to buy your finished product. So, do your homework and find a strong submarket for flipping, then figure out what aspects of a home the buyers in that submarket need when they go house hunting. If the area is not in your backyard, you need a detailed understanding of the local real estate market. For example, permitting times and requirements can vary vastly between markets, and issues with permits can significantly delay a project if not handled well. Whether a home is in a desirable school district can impact the sales price. Researching local laws related to construction and zoning before commencing a flip can prevent headaches down the road. a. Typically, good comparable sales are located no more than 0.5 miles away if in the county, or 0.25 miles away if in the city. Very often the neighborhood changes block-by-block, and it is important to stay within the neighborhood of your subject property. b. Make sure to find properties with similar square footage, and a bedroom/bathroom mix. Pay attention to whether the below-grade square footage is included in your comps. Redfin and Zillow can include that square footage for one property, and exclude it for other properties, so make sure you are looking at apples-to-apples measurements. c. Pay attention to amenities such as quality of schools, proximity to subway, and whether you are on a charming side street or off a major road. These things are not always obvious but come into play when arriving to a valuation of your sales price. d. As a general tip, you want to buy the ugliest house in a good neighborhood. By “ugliest” we mean a house that needs a bit of renovation, both exterior and interior, but has good bones (i.e. no structural damage). You never want to finish your renovation and list your property as the most expensive house on the block, since those often take the longest time to sell. 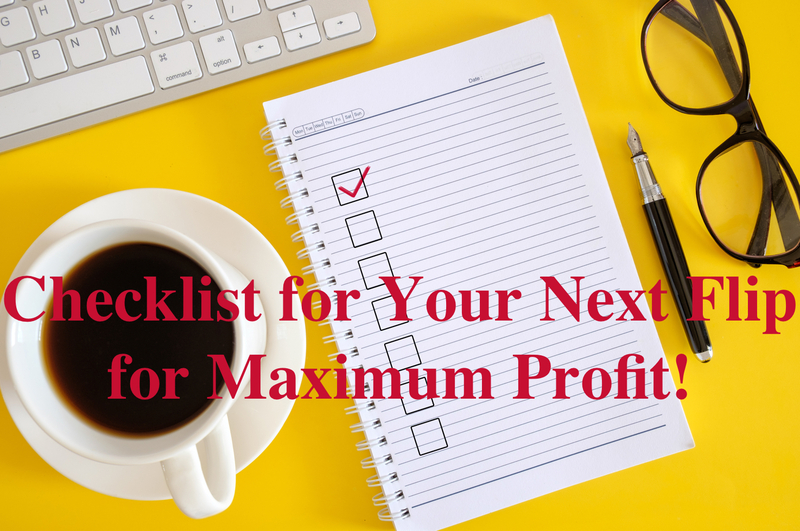 Calculate your projected profit margin and weigh that against your costs, including your holding costs. Make sure to include at least 10% contingency for your budget, as it is rare for renovation projects to deliver on time and within budget. I suggest using a detailed excel spreadsheet to keep track of all the projected expenses, including the cost of capital. Make sure to share your spreadsheet with your contractor, as you will need their confirmation of the various expenses involved. Most investors have a certain number in their minds, say $30,000, which is the minimum amount of profit that justifies their time spent on a given project. Use that number as a tool for vetting the various projects that come across your horizon. As the saying goes, cash is king. If you run out of liquidity midway through your project, you will be scrapping to find the necessary cash to keep your project going. The cost of carry will start to add up, you may lose your general contractor if you halt your project for too long – resulting in a real mess. The rule of thumb is to have enough liquidity to get yourself through the construction draws, and sufficient cash reserves on top of that in case you incur unanticipated expenses. a. Reputable contractor: a general contractor is instrumental to a successful project. A good contractor is someone with a track record completing similar renovations in close proximity to the subject project. Very often good contractors are hard to come by, so make sure to locate a good contractor well in-advance of commencing work on your project. b. Title agent: just as any 3rd party contractor can produce poor or good quality work, choosing the right title company can be instrumental to the success of your project. As a lender, we have seen closings go sideways because a title agent is either not very responsive, overwhelmed and doesn’t start working on the file until a few days before closing, or misses key elements of the transaction and does not obtain adequate title protection for the buyer – something that can be very expensive later on. The goal here is to form a good relationship with one or two competent title agents, and use them on the majority, if not all of your deals. c. Real estate agent: it is a good idea to identify real estate agents who move a lot of real estate similar to your project and get to know them. Deal flow is the lifeblood of a flipping business and having an agent who understands your criteria can be very helpful. You want your real estate agent to let you know about any off-market deals, access to which would give you an edge over your competition. d. Your financing partner: whether you are using your own capital or are partnering up with bank or a hard money lender, make sure to have the capital committed well in advance of the closing. Deals often hit snags, and you want your possible lender to get comfortable with the deal well in advance of a targeted closing date. While traditional banks are often the cheapest source of financing, a lot of investors rely on hard money lenders because of the speed of execution and certainty of closing. The goal is to complete a renovation for the project within a stated budget, and then quickly sell the house, booking a hefty profit in the process. Sometimes; however, things don’t go as planned. The demand for purchasing your house might dry up; so make sure you can rent out the house for an acceptable amount, and secure refinancing. A practical exercise that you can do is look at how much rent the house will generate in case you will not be able to sell it, consider all the expenses, and examine the profit margin. If the house will generate you a total of $1,000 monthly or $12,000 annually, net of expenses, and your equity in the deal is $100,000, it means that you would be collecting a 12% cash-on-cash yield on your investment. If 12% cash-on-cash investment is a viable alternative to selling a renovated house, then your downside is relatively capped.